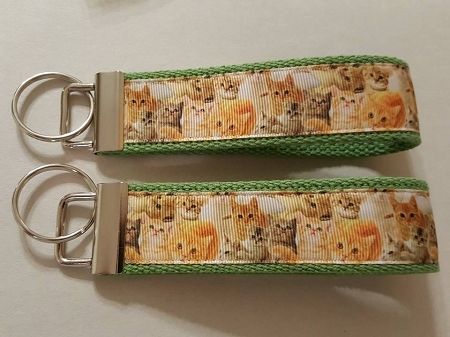 These beautiful kittens will go everywhere with you. The perfect solution for keeping your keys handy! Heavyweight cotton webbing makes this keychain incredibly sturdy and long-lasting. Loop is approximately 5" long (10" in diameter) and will easily fit most wrists. Silver-color nickel key fob hardware & split ring are durable & sturdy. Handmade with 100% cotton, prewashed fabric in my smoke-free home. Fabric placement may vary as each item is handmade.